The story of how I came to be on the show started when I presented my story of conversion as I was teaching my first confirmation class at Holy Sepulcher Parish in Butler, PA. Parishioner Dean Helfer attended that class as a confirmation sponsor and after class mentioned what a wonderful and amazing story that it was. He then mentioned the story to his wife Kathryn, who suggested to me that I contact The Journey Home program about being a guest on the show as she thought it was a story that everyone should hear. After several months of reminders and very good-natured threats by Kathryn before Mass each week, I eventually sent my story to the show and Kathryn wrote a glowing and supporting letter to the network. A few weeks later I received an email that I had been selected to be a guest on the show and after a phone call a date was scheduled for the taping. So on a Sunday in early June, Karen and I made the drive to Zainesville, Ohio because the show is one of the few EWTN shows not taped at the EWTN Studios in Irondale, Alabama. We spent the night in a Holiday Inn Express. The next morning I didn’t feel smarter for having stayed there, but I definitely felt content from being well fed. They had the best hotel breakfast ever, including fresh pancakes done in one minute at the press of a button! 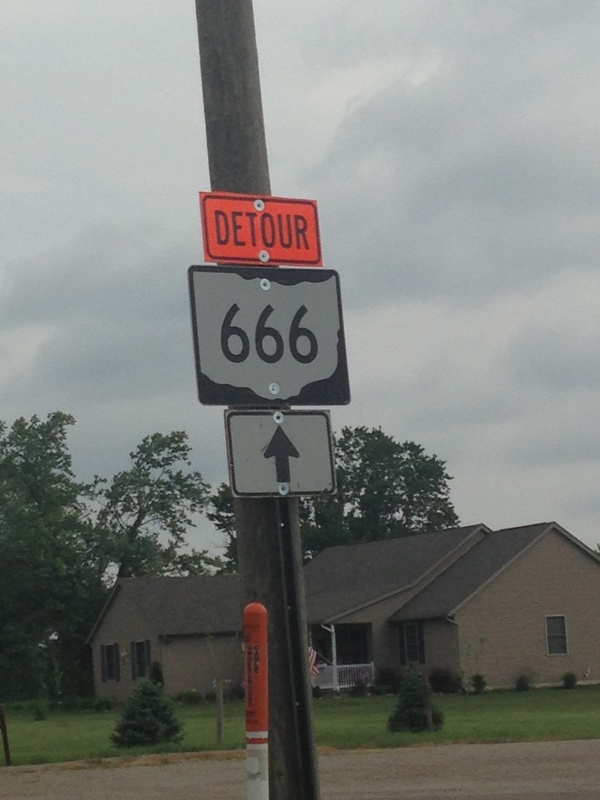 As we made our way to the studio, we became concerned because the route to the studio was also a detour for Route 666! But even if it was the Highway to Hell, after passing some beautiful farms we turned off the road for our arrival at the Coming Home Network Studios. 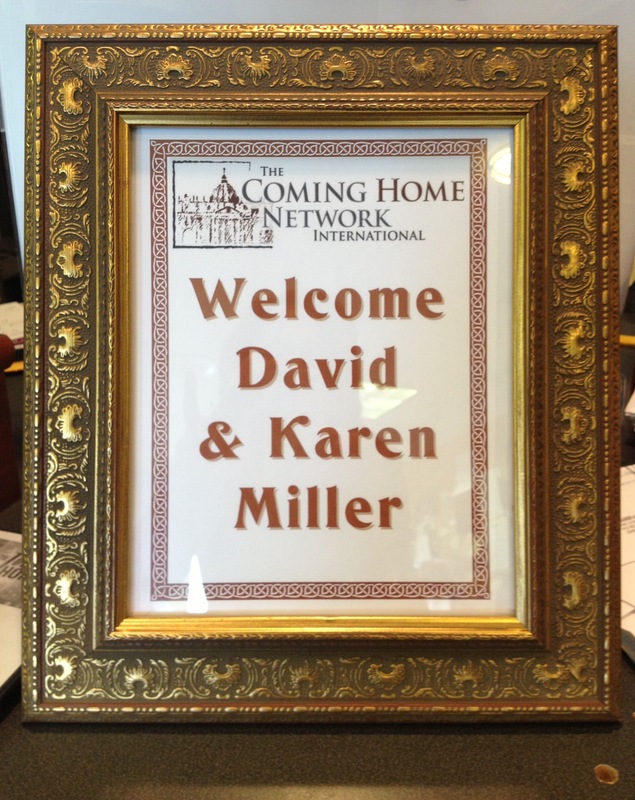 When we arrived at the studios we were greeted by a wonderful sign with our names on it and the warm and friendly faces of host Marcus Grodi and the staff of The Coming Home Network International. We were really made to feel at home. Before relaxing in the green room (just like the Tonight Show!) watching EWTN episodes from Netflix, we were given a small tour of the control room and the set. In the control room everything was really the latest in technology. Many of the cameras were operated remotely, not like the manual cameras I operated as a volunteer recording noon Mass at Mary of Mercy in downtown Pittsburgh. There was video and sound recording and editing equipment that would record my second television appearance. My first since elementary school when my class from Institute Hill Elementary in Butler, Pennsylvania toured the local television station and appeared on a live broadcast of Jackpot Bingo in the early 1970’s. The set was surprising for how small it was. It was just like when I was at the Capitol in Washington, D.C. to sit in on a session of Congress. It appears bigger on television. The desk and chairs are even propped up to make them appear larger. I had always wondered as I watched the program what great and wonderful books of philosophy and theology sat upon the shelves of the bookcases on the set, but the books are ones that you might find in any library or home, where you are more likely to find works of classic fiction or a travel or cooking non-fiction title than a book on religion. Thankfully too, because the backlog of my current and future reading list is really quite long and any possible suggestions from The Journey Home program bookshelf would extend it even more. Now I thought that the most important part of being a guest on television interview program, especially if you have more of a face for radio as I do, is to make sure you improve your looks as much as possible: get a haircut, buy a new suit, shirt, tie, belt, socks, and shoes (although technically I didn’t need pants, socks, or shoes because the camera never went below my chest! ), but in reality the most important part of an appearance on television is to BE PREPARED! I was never a Boy Scout and so this motto is really lost upon me throughout much of my life (I want to be a Boy Scout, I begged, but it was not to be!). Know the story, the anecdotes, the jokes, etc. that you want to speak about ahead of time. Nobody remembers the suit unless it is too loud, the wrong size, too revealing, etc., and I had Karen to prevent those issues. Of course, in fairness to myself it is my own story so I am quite familiar with it. My story is interesting enough, I suppose, but I’m not sure how well that I did telling it. I can talk about my life without even thinking about it, but I didn’t realize that under the television lights and the gaze of the cameras, with your wife watching from the control room, when the host asks you to tell your story, you get a little nervous and you forget important events, people, and memories that when missing from the story reduce its beauty and impact somewhat. However, I do not think that I appear visibly nervous during the show and I was able to myself throughout the interview, even joking a couple of times. When discussing my appearance with a number of parishioners after Mass recently, one of them said, “I hope you mentioned us [the parish].” Since that time others have mentioned, “I hope you mention [this or that]. But I forgot to mention a number of important people (including forgetting to mention by wife by name and maybe even mentioning a previous girlfriend more often!) and important events along the way. Maybe I subconsciously did that so that it was fair and equal for everyone (Karen forgave me though!). I know that upon reflection over the past couple of months I realize that the story is deeper, more involved, and important than I ever realized until now and is very difficult to contain within an hour interview. I do think that this appearance has inspired me to someday write it all out in book form. But if you have an hour to spend on Monday night, you can watch the episode and decide for yourself how it was. If you have any comments or questions about my story after you hear it, I would be more than happy to listen and to answer them and fill any gaps. Send an email to deacondsm@zoominternet.net. UPDATE: The video of my appearance is available on YouTube. Click here to view it. 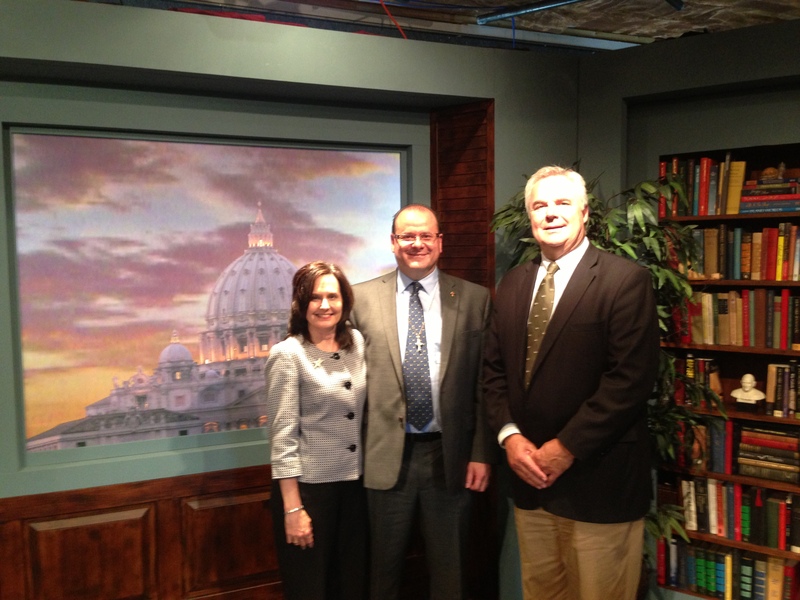 I just watched your wonderful journey on EWTN. May God bless you in your spiritual evangelization where ever you are. I watched EWTN last night and was moved by your story. Praying that God continues to bless you and guide you in your mission for Christ.